Imagine this all-too-common scenario: It’s Wednesday after a late night at work and you’re about to make dinner, but before that you need a quick indulgence, so you follow your instincts. You open your fridge and desperately rummage through the cheeses. Shredded mozz, sliced cheddar, and a stale block of Parmesan are right where you left them -- as usual, the hope to open the door to a delicious surprise does not deliver. But what if it did? The best thing you could wish for is that your roommate left a hefty chunk of Armenian string cheese in the cheese drawer. So what actually is Armenian string cheese? 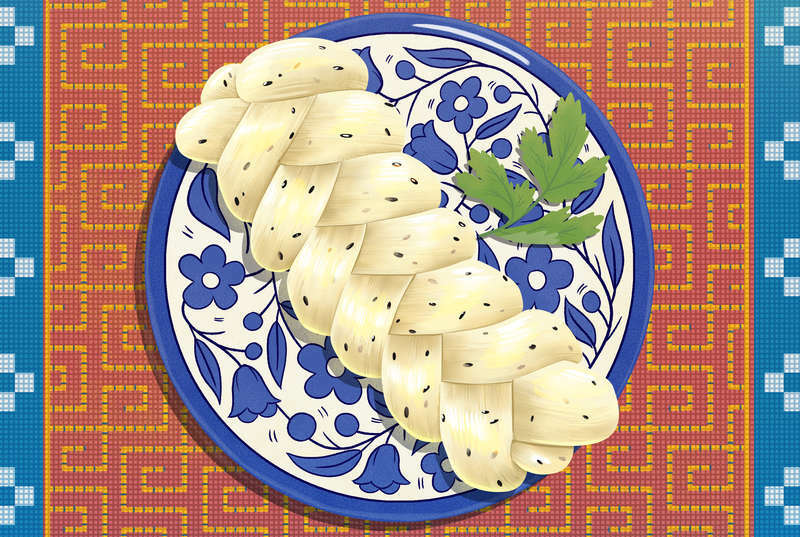 Armenian string cheese, also called Chechil, is a white cheese typically made of goat’s or sheep’s milk, studded with nigella seeds. Far superior to the rubbery stick string cheeses packed in lunch boxes, it comes in a thick, circular braid, which is then unwound to create stringy shreds, perfect for eating by the handful. Nuran Chavushian, owner of Sevan Bakery, an Armenian and Middle Eastern market in Watertown, Massachusetts -- a town bordering Boston known for its significant Armenian community -- describes it as similar to very fresh mozzarella, but saltier, with the seeds adding a slight crunch. As any Armenian knows, it’s a mezze staple. It originated in Armenia and spread after genocide refugees brought it to Syria and beyond in 1915, according to Armenian Food: Fact, Fiction & Folklore. Armenian string cheese is made from drained and then heated, seasoned milk curds. To form the strings the curds are kneaded once warm enough, pulled into a rope, and then plaited into its signature shape. Finally, it’s ripened in a brine. In a much more enjoyable manner than slicing a block of cheddar or a log of goat cheese, you get to use your hands and play with your food like when you were a kid. Pull apart the massive braid into strands, making them thinner and thinner until the large ring you started with has transformed into a flossy pile of string cheese. A fun party idea is to serve the cheese in two bowls, one with finer, thinner strands, and one with thicker ones. According to Chavushian, when the cheese is prepackaged in clear plastic it’s not necessary to rinse in water, but if bought loose it requires a good soak in cold water in your fridge to drain out all that excess salt. What’s the tastiest way to eat it? Fluffy threads of Armenian string cheese will disappear bowl by bowl in front of mindlessly chatting company. Unlike denser cheeses, its saltiness and airiness make it easy to eat, and eat, and eat... not unlike potato chips. Pair with Kalamata olives and pistachios for a low maintenance munchies spread. Chavushian points out that the cheese’s uses extend far beyond the appetizer course, tasting great in a sandwich with tomatoes and cucumbers. He even has customers who bite into a hunk of it like an apple. We also return to the American string cheese comparison once again. Instead of packing a stick of Kraft in your bag to snack on at lunch, why not bring a plastic baggy of Chechil on the road with you? Sure it’s a bit more work, but the peppery kick and fresher taste make it worth the labor of love. Feel free to get creative with it and throw some shreds as topping on heartier entrees, too, like stuffed peppers. As a mild cheese, it tastes super flavorful eaten fresh as opposed to baked or cooked into other dishes, but feel free to experiment with it just like you would with any other versatile ingredient. It’s delicious on a DIY English muffin pizza or stuffed in an omelette. Armenian markets will of course carry this cheese, as will many Middle Eastern and international food stores. But even more popular grocers like Wegmans sell Armenian string cheese. If you’re not near any of these types of stores, you can also order it on Amazon. Alex Erdekian has serious impulse control issues whenever a communal bowl of Armenian cheese is placed on a coffee table during the holidays.